TOKUSO® REBASE MR. BOND is a primer for the bonding of self- curing acrylic resins with non- precious metals. It provides strong adhesion for all self-curing acrylic resins including denture materials made of non-precious metals such as metal plate dentures. MR. 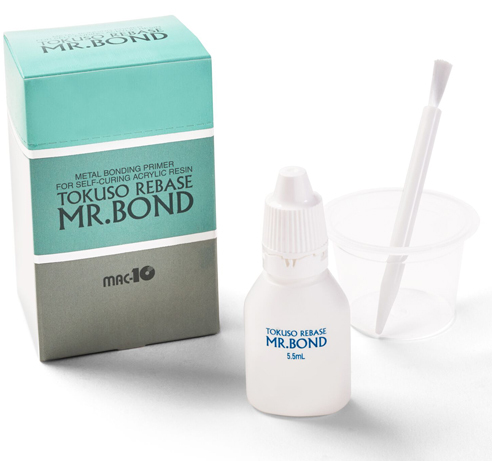 Bond is the perfect companion to Rebase II for metal plate denture relines. It contains an adhesive monomer, Mac-10, developed by Tokuyama Dental, for strong adhesion to chrome-cobalt alloys, nickel-chromium alloys, titanium alloys and tin-plated precious metal alloys.